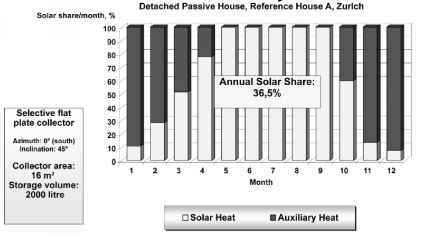 Heating DHW with solar energy in a high-performance house is sensible. In such houses, the energy needed to heat domestic water can equal or even exceed the energy needed for space heating since the latter has been so far reduced by insulation and heat recovery. Furthermore, demand for heating domestic water is a 12-month energy demand, including the high insolation summer months. Using a solar system is therefore an effective way of reducing the total primary energy demand. Increasingly, the market for solar water systems also includes systems that provide, in addition to water heating, space heating in winter. For a high-performance house, a high-performance collector is a good choice, particularly if the collector should provide both water and space heating. A high-performance collector is able to produce more heat during the shortened mid-winter heating season of such houses. Flat-plate collectors. A high-performance flat-plate collector is characterized by a superior absorber and glazing. The absorber should have a coating with a high solar absorption, black paint (>95 per cent) and low heat emissivity selective coating (<5 per cent). The glazing should be anti-reflection treated and consist of a low iron glass type to maximize solar radiation transmitted to the absorber. Such flat-plate collectors can easily achieve outlet temperatures of 80°C with a conversion efficiency of about 50 per cent to 60 per cent. Evacuated tube collectors. This type of collector achieves superior performance because the vacuum surrounding the absorber drastically cuts heat losses to the ambient. Outlet temperatures above 100°C are easily achieved with a higher conversion efficiency compared with a flat-plate collector. The inside-facing underside of the glass pipe has a reflective coating to irradiate the absorber from beneath. Thus, vacuum collectors have the further advantage of not requiring any given slope for optimal performance. The glass pipes can simply be rotated to the optimal incident angle for the application. For this reason, they can be mounted on a south façade or roof. 1 Conversion factor: the collector efficiency when the ambient air temperature equals the collector temperature. 2 Heat loss coefficient: the mean heat loss of the collector per aperture area for a measured temperature difference between the collector and the ambient air temperature in W/m2K. These collector constants are determined under exactly defined conditions (global radiation intensity, angle of incidence, air temperature, wind velocity, etc). The performance of different collector types and applications are shown in Figure 12.2.1. 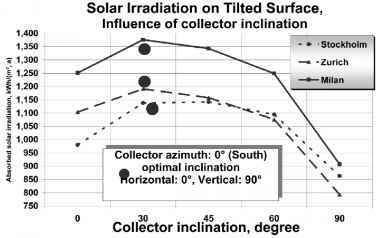 The efficiencies are given for the temperature difference between the collector and ambient divided by the solar radiation. Logically, as the collector gets hotter, the efficiency falls off. For heating of high-performance houses, selective coated collectors or vacuum pipe collectors are a good choice. performs better in winter with low sun angles. When there is snow cover on the ground, it receives an extra portion of ground-reflected solar radiation. Roof collectors with too little slope, by contrast, will have zero output when covered by snow. A big limitation of façade collectors is, however, that by low sun angles, neighbouring buildings and trees will cast shadows on the collector surface. Façade collectors perform worse in Zurich than in either Milan or Stockholm. This is possibly explained by the higher frequency of overcast weather in Zurich. Surprisingly, within a large range, the size of the tank relative to the collector area is not a major factor affecting system performance. This is evident in the example of an apartment block shown in Figure 12.2.3. Doubling the tank size increases the solar share by less than 15 per cent. More important is avoiding the mixing of the hot water at the top of the tank with cooler water at the bottom, the insulation of the tank and the avoidance of thermal bridges (for example, the feet of the tank). The size of the tank should not be oversized because that would increase heat losses and investment costs. 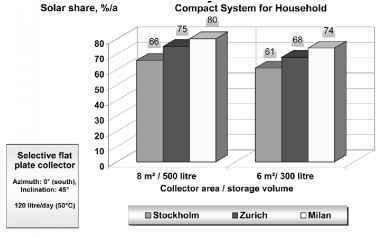 For economy and energy efficiency, the tank should be from 1.5 to 2.0 times greater than the daily hot water demand, and the collector area between 1 and 2 m2/occupant. Typically, designs for solar hot water systems in households are 3 m2/300 litres for up to 3 persons, and 8 m2/500 litres for 4 to 5 individuals. Performance for these two variations is shown in Figure 12.2.4. For solar-combined space heating and domestic water heating systems, the storage can be combined with the heat distribution subsystem - for instance, floor heating, which further increases the heat storage capacity. In this case, heat can be extracted from the lower section of the tank for the radiant floor heating and the upper part of the tank for DHW. The water supplied to the collector can come from a heat exchanger at the bottom of the tank where the coolest temperatures occur. This maximizes the collector efficiency. The location of the hot return from the collector to the tank depends upon the flow rate. For high-flow collectors, this connection can be quite low. On the other hand, this connection should be a higher or even better variable (stratified) for low-flow collectors. For solar combi-systems where hot water is supplied to a water-to-air heat exchanger in the air supply duct or to a water-to-water heat exchanger in a water heat distribution system, the connection should be at the top of the tank, where the highest temperatures occur. For radiant floor heating, the connection can be in mid tank, since the required temperature supply is much lower. ate climates, the annual coverage should reach 70 per cent for a single family house and 40 per cent for an apartment block. Coverage for the latter is generally lower because of lack of roof space for the stack of apartments below. Summer coverage in the temperate and mild climates should be designed to be under 100 per cent to reduce system overheating. 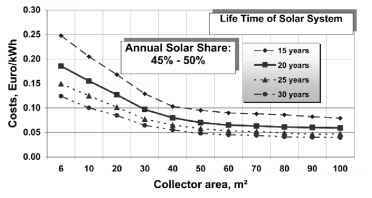 Figure 12.2.7 Solar heating kWh costs in relation to collector area area for a single installation increases, the unit costs decrease sharply up to approximately 100 m2, as can be seen in Figure 12.2.6. This translates to lower kWh costs for the solar heat, as illustrated in the example for Vienna in Figure 12.2.7. 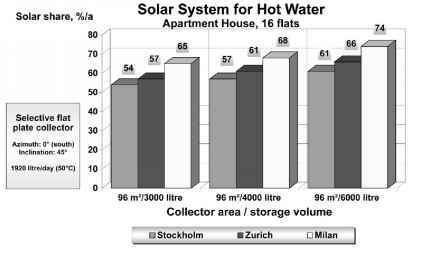 Hygienic aspects of solar water heating. In some solar active system configurations the storage tank contains drinking water. There is then the risk of the so-called Legionnaire's disease, Pneumonia Legionella. It is caused by Legionella, or rod-shaped, mobile, aerobic bacteria that occur naturally in surface water and groundwater. They begin to propagate at temperatures between 20°C and 50°C, with optimum growth occurring between 30°C and 40°C. Above 60°C, they die off quickly. A long residence time in water at favourable temperatures may result in high concentrations of Legionella. Stagnant water in pipes or parts of an installation that have not been flushed are breeding grounds for these bacteria. To prevent Legionella, the water temperature should either be below 25°C or above 50°C. Disinfecting a contaminated system can be done by flushing it, then heating the water to 60°C for 20 minutes. In general, solar thermal systems for hot water preparation are backed up by an auxiliary heating system to achieve temperatures above 50°C. In this manner the risk of Legionella contaminated water can be minimized. • Small systems are considered to have a very low risk and do not need special attention. Small systems are installations in one or two family houses, or installation with a volume less than 400 litres and with less than 3 litres in pipes between the heater outlet and draw-off point. • Large systems should be designed so that they can be heated up to 60°C to a frequency prescribed by the building/sanitary code. Many configurations of solar combi-systems and backup systems have been tried. From 1975 to 1985, these systems were custom engineered. Through a cooperation of the International Energy Agency (IEA) Solar Heating and Cooling Programme (SHC) Task 26: Solar Combi-systems (see www.iea-shc.org/task26/index.html), existing designs have been analysed and optimized and a valuable design handbook produced (Weiss, 2003). 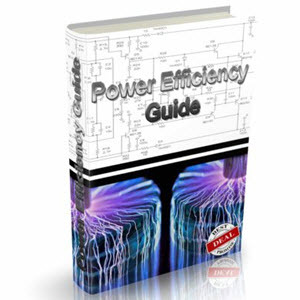 Today, solar companies offering simple and economical systems frequently offer system design as part of their service. Components of solar combi-systems are factory assembled in compact units, making the onsite work of the installer easier and ensuring better reliability. Currently, installed systems demonstrate that solar space heating is possible even in northern locations. In high latitudes, it would seem that such systems make little sense, given the minimal to zero solar radiation in mid winter. However, solar irradiation from September to October and March to May can make a useful contribution during the beginning and end of the heating season. Especially in northern countries, as well as in alpine areas, some heating during the summer period will increase living comfort. In summer, the solar radiation is double that of winter, ensuring a high coverage of DHW demand. To achieve maximum overall system efficiency, priority is given to the load (DHW or space heating) with the lowest temperature level so that the solar collector works with the highest efficiency. Figure 12.2.8 shows the computed monthly performance of a combi-system in the Zurich reference temperate climate. In centralized concepts, a central storage tank is supplied heat from collectors located through the housing project. The major advantage of a centralized system is the reduced unit costs due to the scale of the project, when all houses have collectors. A further advantage is the small tank heat loss because its large volume results in a very beneficial surface-to-volume ratio. This benefit is offset, however, by the serious heat loss from all the pipe runs. This is especially critical in summer when the losses are the same but the demand for heat is small. It is also serious in winter, given the small space heating demand of very low energy housing.